SellerCloud calculates inventory and records quantities in several places using different terms. 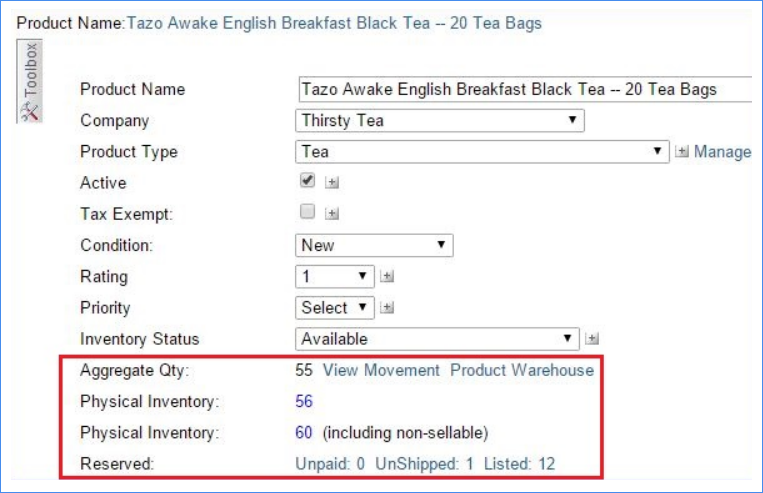 This topic introduces the common inventory terms that appear in two locations. Quantity that is available for sale (Physical Inventory in Product Warehouse - Reserved Qty = Aggregate Qty). Note: While this is the available qty, safety qtys will limit the available qty per channel. Sum total of Aggregate Qty + Reserved Qty. While this is generally accurate, it is not necessarily the true Physical Inventory Qty in sellable warehouses, which you can view on the Product Warehouse page. For technical reasons, the above calculation is used rather than pulling the quantity from the product warehouse. Total Inventory across all warehouses. This appears when the Client Setting Show Physical Qty including non-sellable in product home page is enabled. Quantity that has been reserved from the Physical inventory for open orders. Reserved inventory is broken down to Unpaid orders and Paid but not yet shipped. Note: These columns appear when the relevant Client Settings are enabled. Quantity that is available for sale. (Physical Inventory - Reserved Qty (for orders) = Aggregate Qty). Total Inventory across all warehouses. (Ph. Sellable Agg. Qty + Non sellable Qy = Ph. Agg. Qty. Alternatively, Agg Available Qty + Reserved Qty + Non sellable = Ph. Agg. Qty). Qty across all Non Sellable warehouses. The sum total of Aggregate Qty + Reserved Qty. While this is generally accurate, it is not necessarily the true Physical Inventory Qty in sellable warehouses, which you can view on the Product Warehouse page. For technical reasons, the above calculation is used rather than pulling the qty from the product warehouse. A column shown above the grid, this relates to Inventory Valuation. The Client Setting Show Total Inventory in Manage Inventory Grid using .. controls the mapping of that value to either the Ph. Agg. Qty, Ph. Sellable Agg. Qty, or Agg Avail Qty with a default setting of Agg Avail Qty. Read about inventory movement history.